Here's your chance to secure a charming home to live in now, with plenty of room to put your own stamp on it. 1 Rosecliffe St was last sold over 6 years ago. Since that time it has served its current owners as a fantastic family home. Ideally positioned, 1 Rosecliffe St is walking distance to South Bank cafe and dining precincts, South Bank cultural centre, cinemas, theatres, Brisbane State High School and hospitals. Nestled in a tranquil tree lined cul de sac, this charming 3 bedroom + study home offers endless promise with peaceful interiors and an outdoor timber deck area. Stepping inside from the deck, the spacious lounge flows seamlessly through to the dining room via an ornate archway. The spacious timber kitchen off the lounge features stainless steel appliances with a gas stove. Down the hall, the bedrooms are generous and two boast extra large built-ins. There is also a sizeable study located off the master bedroom. The bathroom completes this level. A lock up garage, large storage areas, extra toilet and laundry are located downstairs, together with 2 extra off street car parks adjacent to the garage, and a sizeable backyard perfect for children. The home features high ceilings, district outlooks, ornate cornice work, VJs, leadlight windows and timber floors that combine to create a home of distinct charm. Surrounded by picturesque homes, leafy streets, cosmopolitan attractions, 1 Rosecliffe St is located just 2kms from the Brisbane CBD. This Worker's Cottage has much to offer the buyer, perfect for further renovation and expansion to suit your own taste. 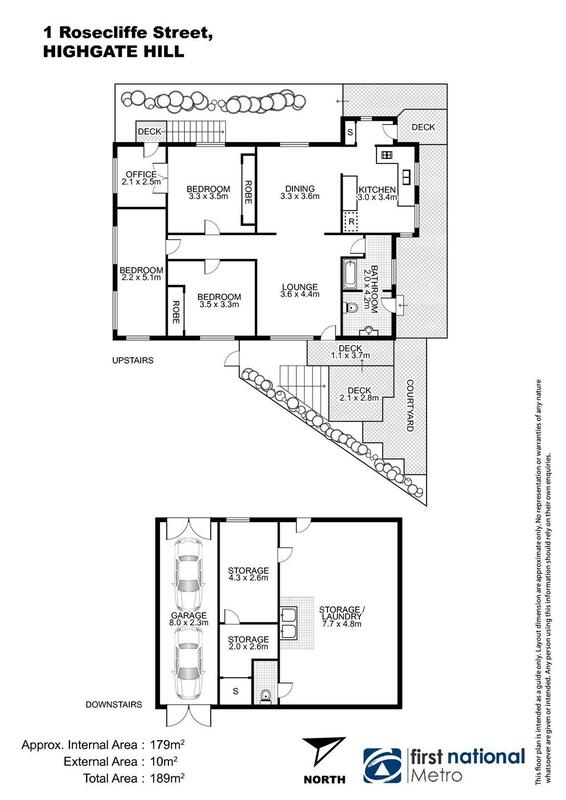 Ok to live in or rent (expected return approximately $500 - $600pw) while you get your plans approved. You will be spoilt for choice with ample educational options with the property being located in Brisbane State High Catchment, and close to St Ita's Primary School, St Laurence's College, Somerville House, QUT, UQ and South Bank TAFE. Here's your chance to create your dream home in a dream location.